I hope you are enjoying your area’s Fourth of July festivities, as well as some time with family and friends. This is the third and final post for “Barbecue Week” here on my blog, and I have an idea for a healthy appetizer. I have also created a to-go box to serve it in; hence the title “Mobile App”! I have been following The Pioneer Woman–Ree Drummond–for a long time. Having grown up in western Nebraska, I felt an instant connection to this woman who lives on a ranch in Oklahoma. I own all of her cookbooks, and, in fact, I stood in line at the Tattered Cover Book Store in downtown Denver, CO to have her sign my copy of her first cookbook. It’s a labor of love, for sure, as it takes some extra time and effort to dice everything up, but you will not be disappointed with the end result. People appreciate having a healthy option, and you can’t get more guilt-free than this–especially when you serve it with vegetable tortilla chips! Doesn’t this look incredible? The best part is, it tastes as good as it looks! It’s cool and crunchy, and the sweetness of the watermelon balances out the flavor of all of the peppers. I found these treat cups at my local dollar store, and I filled each one of them with the pico de gallo. This would be an easy way to allow guests to take the appetizer to anywhere in the backyard, but there’s no place for the chips. They would have to go on a separate plate. So I challenged myself to design a box that could hold both the treat cup and the chips, similar to the boxes your food comes in at sporting events. I found these treat liners at Michaels this week at 50% off, and I used the gingham and stars patterns to line the inside of my simple box design. I started with a 12″ x 9″ inch piece of paper, scored each side at 2 1/2″, and put the box together. There isn’t anything complicated or fancy about the boxes, but the treat liners make the boxes food safe and they are the perfect size to hold both the pico de gallo and some chips. Now this appetizer truly is portable and mobile, and guests can take it anywhere they want to be. Mission accomplished! After I had taken all of the pictures, my husband and I each took a box and enjoyed our “mobile app” out on the deck with a glass of wine. The box helped brace the cup as you tried to get some pico de gallo onto a chip, which is an added bonus! P.S. Did you happen to notice the watermelon towel in some of my pictures? My nephew’s wife, Jodi Kostelnik, made it. 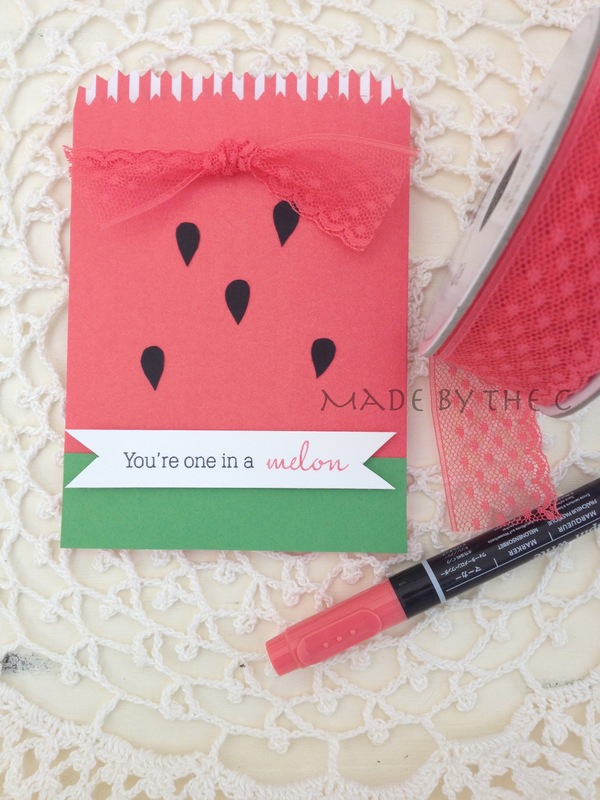 She creates and screen prints food-themed designs onto hand towels, onesies, tote bags, etc., and the watermelon print is one of her newest additions to her shop. Visit her website here and enjoy looking at all of her clever designs and gift items. Welcome back to Part II of “Barbecue Week”! It’s Friday, and the long Fourth of July weekend is about to begin. I can’t believe that tomorrow is July 1st–where did June go?! In keeping with the focus on barbecues, today I have a fun dessert idea that would be perfect to serve at or take to a cook-out–hand pies. Sweet, round, fruit-filled miniature pies. The concept is brilliant, and I can’t think of anything more American, or better suited for a Fourth of July barbecue than hand pies. They require no cutting or serving; guests can just grab them and eat them on the go. My vision was to make both strawberry and blueberry filled hand pies with star cut -outs in the middle of the top crusts to carry out the Fourth of July theme. I had picked up this recipe card at Stonewall Kitchen recently, which I thought would be perfect for the blueberry hand pies. After a little more research, I found a strawberry hand pie recipe that I liked, so all that was left was for me to put on my apron and get to work. I will share the links for both recipes at the end of this post. Both recipes provided instructions on how to make hand-made crusts, but I used prepared pie crusts instead. I wanted my hand pies to be round, although they can be made in all kinds of shapes–half moon, triangular, rectangular, etc. I did make each of the fillings, and the blueberry filling consisted of both blueberry-rhubarb jam and a cream cheese mixture. The blueberry fillings were pretty liquidy–how’s that for a technical cooking term! Because I didn’t want all of the filling to escape out the star-shaped hole, I followed the recipe exactly and just cut a slit in the middle of the top crusts. The strawberry filling, on the other hand, was very congealed, so I did use the star cookie cutter on those top crusts. and the strawberry. Look how sweet my little pies look with the star cut-out. In the end, I could have used the star cut-out on the blueberry pies, as the filling didn’t seep out of the slits at all. While the pies were cooling, I started working on a packaging idea, which is where the diaper fold comes in. The diaper fold has been around for a long, long time and when all of the folding is done, you end up with a pouch. The best part about the diaper fold is that you only need a square piece of paper; no special tools or adhesive is needed. Just a square piece of paper. I chose to use parchment paper, as it is food-safe and I really like how crisp and white it is. After some trial and error, I determined that I needed to start out with a 9 1/2″ square in order to fit the hand pies. Next, fold one of the bottom corners over to the other side, making sure that you have a straight line across the middle of the triangle. Repeat with the other bottom corner. Fold down the top flap, and you’re done. The flap keeps everything closed together–as I said, no adhesive is needed. Here’s what the pouch looks like inside. This is going to be a perfect for the hand pies! Now it’s time to dress these pouches up–I can’t serve my cute hand pies in plain white pouches! I ended up making some paper rosettes and decorating them with layers of stars. The rosettes reminded me of the buntings you see everywhere, and they also mirror the round shape of the pies. My plan was to tie some baker’s twine around each of the pouches, and then tie the rosettes onto the twine. I didn’t like how this looked, however, so I went back to the drawing board. I ended up making double baker’s twine bows and I tied the rosettes to the bows. And there you have it–really cute, food-safe diaper fold pouches for my sweet, round, fruit-filled miniature pies! Wouldn’t you just love to serve or take these cutie pies to a get-together?! Better yet, wouldn’t you just love to sink your teeth into one of these cutie pies?! It’s hard to see in the close-up picture of the blueberry pie, but the two different fillings really didn’t mix together during the baking. If I were to make these again, I would add the cream cheese filling first, and put the blueberry-rhubarb jam on top, so that the blueberry filling showed through the star cut-out. And, how did it taste, you ask? It’s not bad–you definitely need the cream cheese mixture, as it tones down the tartness of the jam. I don’t think I would make the recipe again, however. I think I’d be happier with a blueberry filling similar to the strawberry one. The strawberry pie gets my vote, hands down! This is exactly what I wanted–a round hand pie with a star cut-out in the middle of the top crust. The filling was congealed enough that it didn’t ooze out during baking, nor did it ooze out when you broke it in half. And the taste–simply divine! I would definitely make this recipe again–the filling isn’t complicated to make, and the whole process goes pretty quickly if you use prepared pie crusts. Look how cute this diaper fold pouch is as a silverware holder! I’m telling you, these pouches couldn’t be any easier to make, and they are so versatile. The sky is the limit! It’s “Barbecue Week” here at Made by the C. With summer in full swing, and Fourth of July just around the corner, I thought it would be fun to design some projects with backyard barbecues in mind. Between today and next Tuesday, I will be featuring three different ideas of what to make and/or bring to a barbecue, and how to package it up. Whether you are hosting or traveling to a get-together, I hope that you will find some inspiration during this 3-part series. It’s always nice to bring a hostess gift in addition to your food contribution to a get-together, and you can’t go wrong with a nice bottle of wine. So, for my first project, I designed a unique wine bottle tag that will set your bottle apart from others. After all, you know what they say, “It’s all in the packaging”! I’m going to be using the very first stamp set I ever bought on this tag. I know I’m going to be dating myself, but I purchased this set back in 2005. It’s long since been retired, but it is still one of my favorite sets and I look forward to using it every summer. The images are perfect for barbecue- themed projects, and I have never seen another set with images as versatile as these since then. As you can see in the picture above, I chose a red, white, and blue color scheme, and I made 4 different oven mitts, which will become the stars of this tag. With the top part of the tag completed, it’s now time to focus on turning these 4 oven mitts into wine charms, which will get attached to the middle part of the tag. I took hoop earring wires that I purchased at my local craft store, along with a few additional supplies, and turned them into wine charms. The one thing that I discovered is that you need to use a jump ring to attach the oven mitt to the hoop earring wire, in order to get the mitt to lay flat. Once all four wine charms were completed, it was time to finish up the tag. I added more gingham paper to the bottom of the tag, and threaded some white baker’s twine through some punched holes. I tied the wine charms on to the tag with the twine, wrapped some coordinating paper around the wine bottle, and my project was done. I am in love with how this turned out! The tag with the wine charms would make a great gift by itself, but put it on a bottle of wine, and you are sure to impress your hostess! This tag would make even a cheap bottle of wine look like a million bucks. It truly is all in the packaging! I am using these jars in my pantry to provide a splash of color. as well as these jars in my craft room have been re-purposed as home decor. Mason jars work really well for craft projects. Since I tend to use them often, I am starting a new series here on my blog entitled “Mason Mondays” to highlight my posts using these jars. Anytime I feature a mason jar in my project design or packaging, I will post it on a Monday under the “Mason Mondays” heading. Today is the first post in this series, as I used the 4 oz. mason jars for my husband’s Father’s Day dessert. He loves Key Lime Pie, and when I found this recipe for Key Lime Pie Cups, I knew these would be the perfect ending to his Father’s Day meal. followed by the key lime filling. The filling gets topped with Cool Whip and graham cracker crumbs, and then the cups need to refrigerate for at least 1 hour. Just before serving, place a lime wedge on each cup. All I needed to do now was put each Key Lime Pie cup on a dessert plate and pour the coffee. My husband could hardly wait to dig in! Look how sweet each dessert looks in the 4 oz. mason jars! And it tasted just as good as it looked–I love it when that happens! It was very light and refreshing–a perfect summertime treat. My husband had 2 servings, so I think we can call this recipe a success! Check, check, and check! Stampin’ Up! has even gotten in on the trend–one of the new colors that they introduced in June is called Watermelon Wonder. 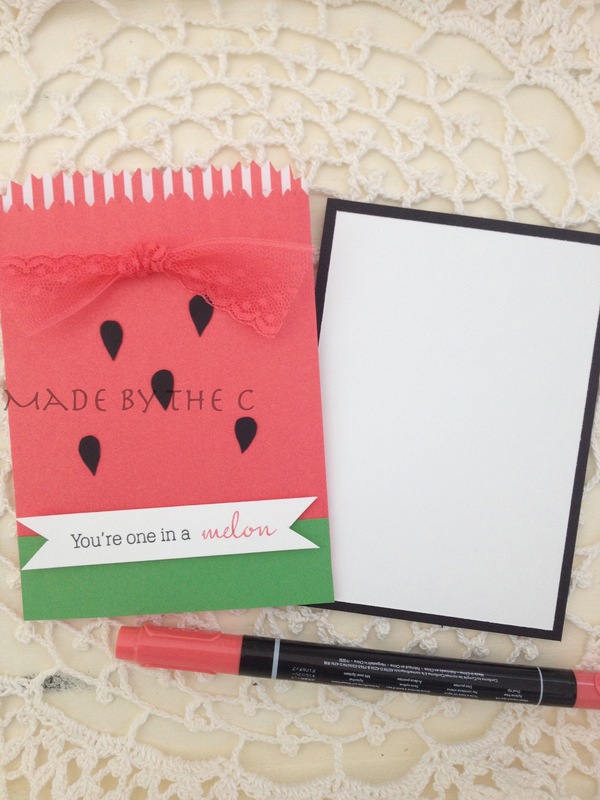 This has sparked a multitude of watermelon-themed projects, including this mini treat bag designed by Cindy Schuster. I thought it was so sweet and clever that I needed to make one for myself. I used the same basic elements that Cindy did, but I changed the design slightly to make it my own. The paper is double-sided, and the striped pattern on the inside breaks up the solid color and adds a lot of interest and charm to the bag. And look at that beautiful lace trim! The color and pattern are very elegant, and yet is takes on a casual, fun appearance in this instance. I made the seeds using a heart paper punch, just as Cindy explains in her blog post. It is such a creative idea! 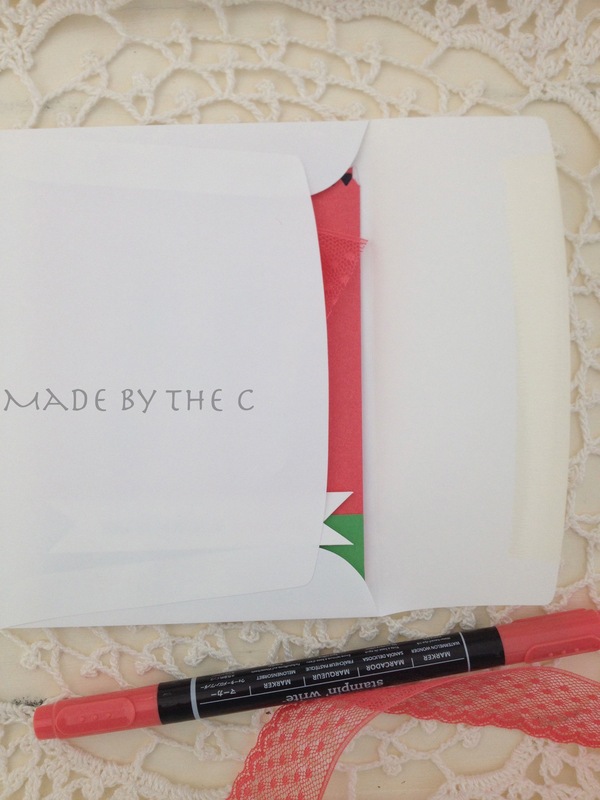 I decided to turn my project into a thank you note, so instead of enclosing a treat, I made a notecard to slip inside. 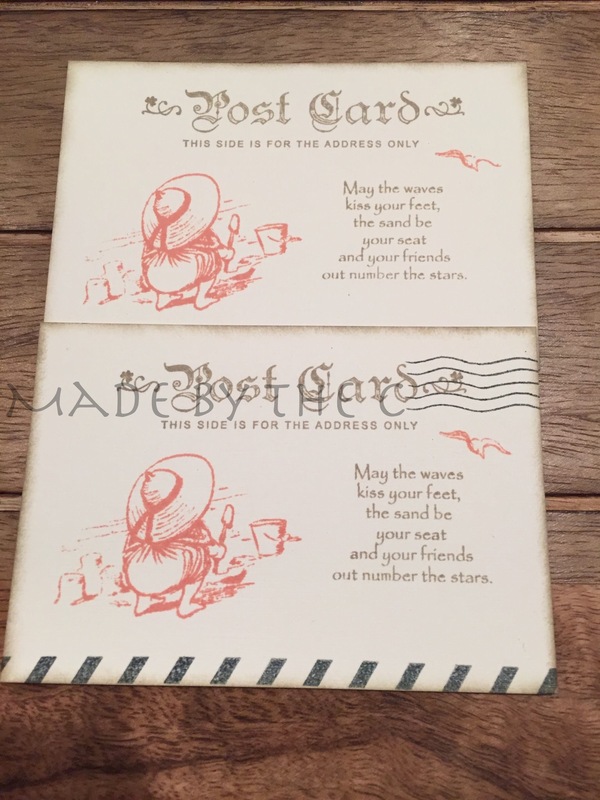 I love having the flexibility to use a product in more than one way, and, in fact, versatility is one of the main factors I consider before purchasing a stamping product. I have to know that I’m going to be able to get more bang for my buck before I’ll buy something. I knew that the mini treat bag die by Stampin’ Up! passed my versatility test when I learned that it can fit inside a standard-sized envelope (5 3/4″ x 4 3/8″). It’s one thing to know that you can create cute projects like this, but to know that you can mail them too–that just put’s it over the top, in my opinion! Who wouldn’t want to receive one of these bags in the mail! 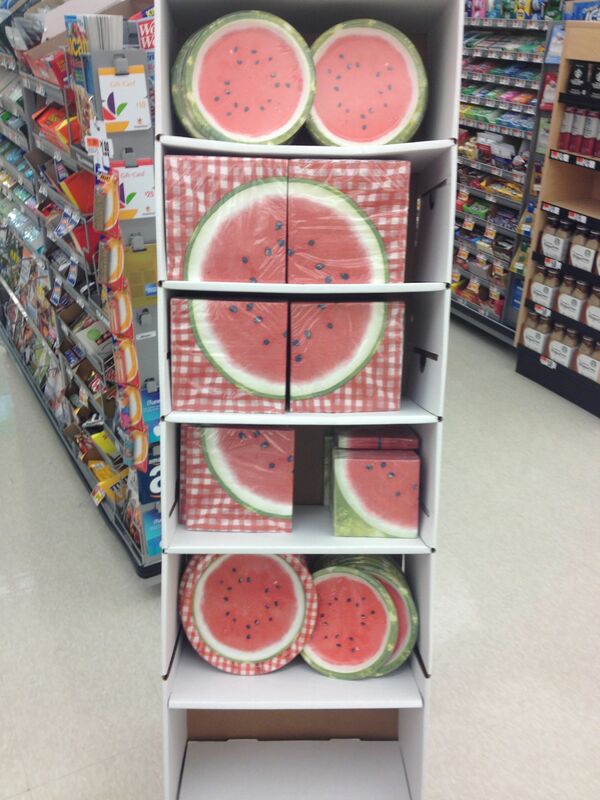 As I mentioned at the beginning of this post, watermelon seems to be a popular theme for this summer. Besides seeing some interesting projects, I’ve also found some recipes that I’d like to try. First on my list is The Pioneer Woman’s Watermelon Pico de Gallo (salsa). For all of the other watermelon recipes, products, and projects I’ve discovered, please check out my Pinterest board. 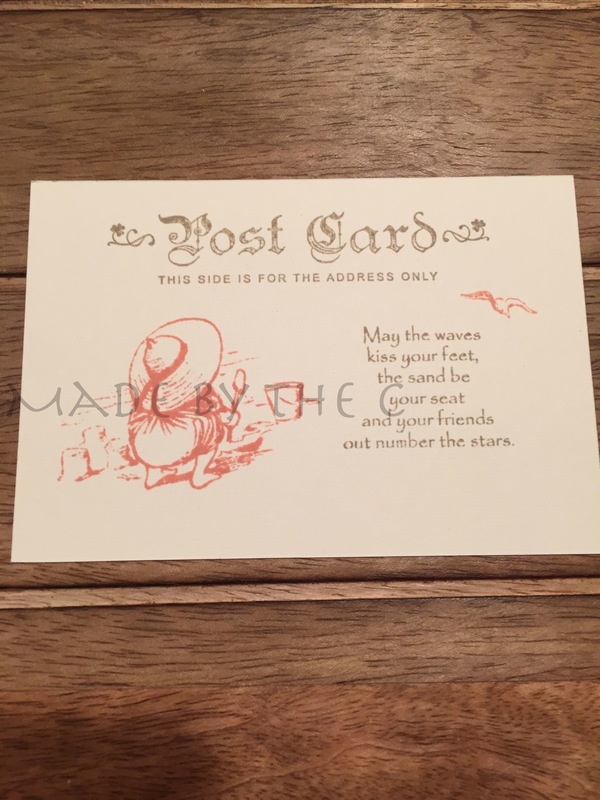 “May the waves kiss your feet, / the sand be your seat, / and your friends out-number the stars”. I’ve discovered that I make a lot of things in sets. I like sets. I like that there are multiple items in the grouping, and that everything coordinates together. One project that I love to create for each current season is a notecard set. 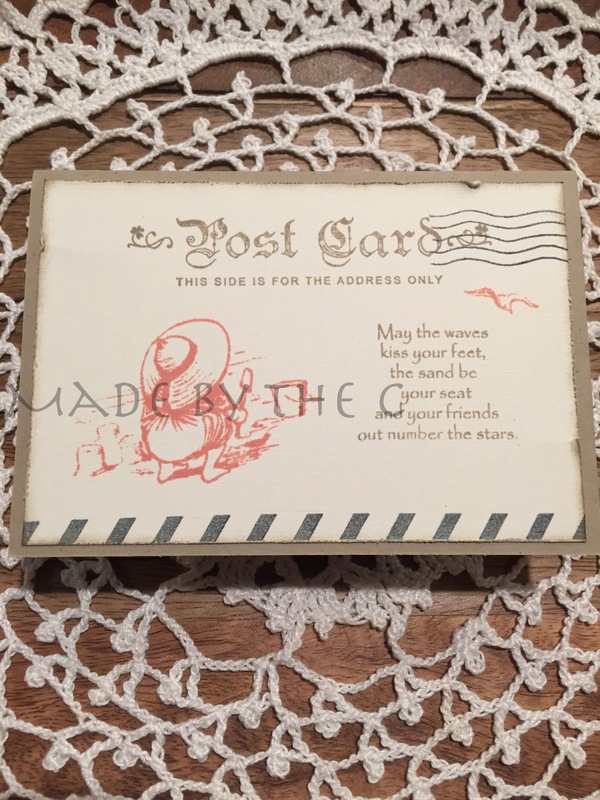 It’s so handy to be able to grab one when the need arises, and the size is perfect for a short, handwritten message. I do so little writing by hand that filling up a notecard is about all I can do before my hand starts to cramp. 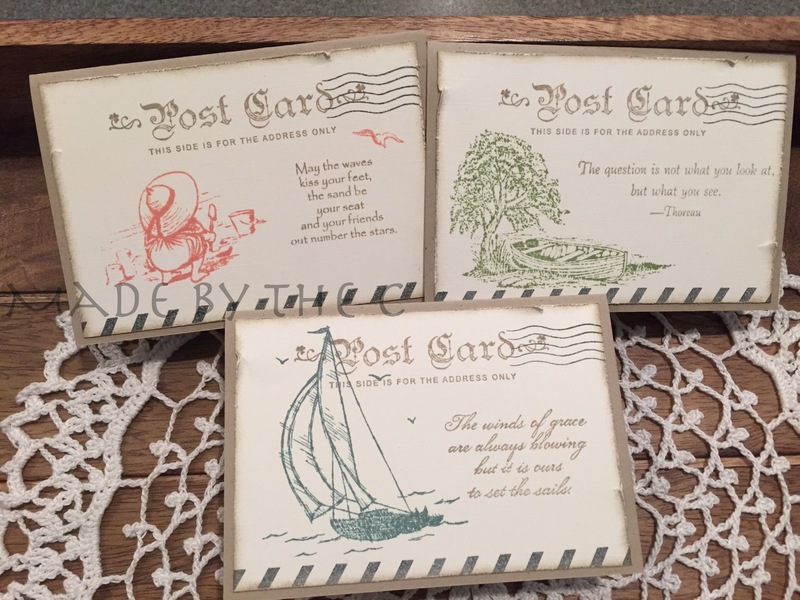 I designed the notecard fronts to look like vintage postcards using a few of my favorite summer-themed images and sentiments. Developing and creating a vintage look is a multi-step process, and I’d like to highlight and explain each step in more detail by taking one of the postcard images from start to finish. The ultimate goal is to create an image that looks yellowed, worn and faded, so choosing the right paper, ink color, and image is key. Cream card stock is ideal, as it gives off an aged appearance just because of the yellow tint to the paper. 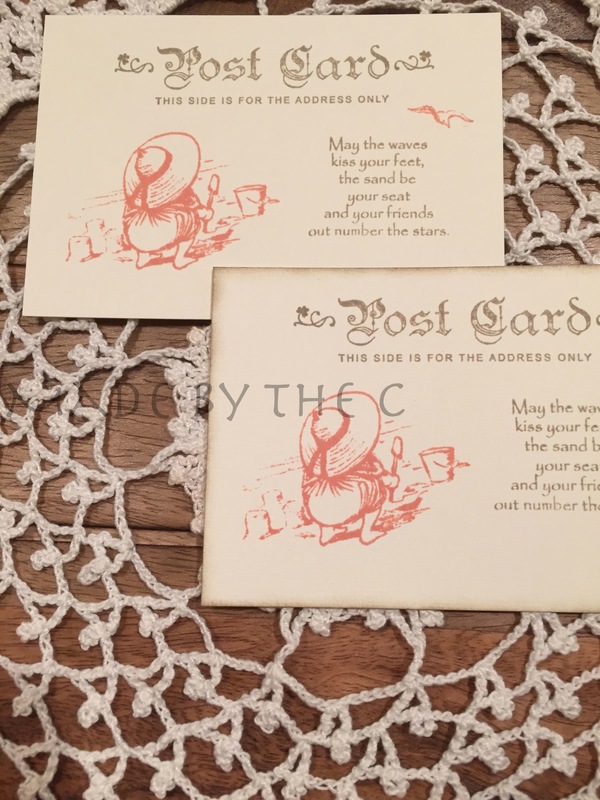 Choosing a muted ink color helps add to that aged, faded appearance, and the ink color will dull even more when stamped on the cream card stock. The image you choose should be classic and timeless, as it lends credibility to the likelihood that it could be old or vintage. On a side note, you may recognize the sentiment used on this postcard design–it’s the sentiment I use in closing each of my blog posts. It came in a stamp set that I purchased back in 2008. I fell in love with the phrase the first time I read it, and when I started my blog, I knew it would be the perfect ending to my posts. Once you have your images stamped, the next step is to create the illusion of age by sponging the edges of the paper. It’s amazing how something as simple as sponging the edges of the paper can add so much. I chose to sponge the edges with the same color that I used for the wording, as I wanted it to blend in, rather than detract from the main image. Our vintage card is getting there, but it needs some contrast and something to take up the blank space at the bottom. I added the cancelled stamp image in the upper right corner, and the airmail stripe along the bottom in black, and that’s just what this card needed. I stamped each image on paper once before stamping it on the card to get the faded black color. Now that you know what went in to creating this look, you have a better appreciation for the end product. I have devoted many the hour to mastering this vintage look, and it’s like anything else, once you understand the how’s and why’s of the process, you have a greater chance of success.